John Mullarkey teaches the basics of tablet weaving (or card weaving) on this 120-minute video workshop. Learn techniques for successful weaving, including fixing mistakes, finishing tablet-woven bands, and more. 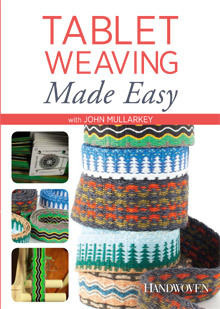 Order your copy of Tablet Weaving Made Easy with John Mullarkey today! This 120-minute weaving workshop is available on 2-disc DVD Set or as a video download in standard or high definition.